Why not mix them up? Some of the greatest writers have drunk whisky. I’m not advocating that for anyone — I never write unless I’m sober, and responsible imbibing is the message here. But I think they can go together. I often have a dram while I’m reading. Both I do at the end of the day to relax. And since I muse a lot about other weird stuff, I’ll be writing about whisky to relax, too. Note: what I won’t be doing is getting overly-wrought in my descriptions. I do not pretend to be a super-taster, capable of discriminating upon which Caribbean island my toffee was browned. And that’s OK as most likely, you aren’t either. So we’ll keep it sane. So let’s start with a standard and safe selection, a dram no one will criticize you for buying and everyone will enjoy (no overpowering peat, smoke or oil). The Macallan 12-year-old. Whenever you see a whisky that’s ‘the’ something, you can bet it has been around a long time. But it does not necessarily mean it is good. ‘The Glenlivet’ 12-year-old, for example, has been around for ages. The Glenlivet is the first single-malt many (such as I ) tried and it has admirers, but to me, the cost/benefit just is not there. The Glenlivet to my palate is uninspiring — just not a lot of ‘there’ there. For a bit more you can get Highland Park 12, which has vastly more character, or Ardbeg, . But back to the Macallan 12. You have to give those folks at Macallan credit. They use barrels that have been used to age sherry. But not just any barrels — they buy the barrels themselves, from wood they select, then essentially rent them to the sherry producers and get them back after a single run. So Macallan guarantees a steady supply of sherry-aged oak in top condition. 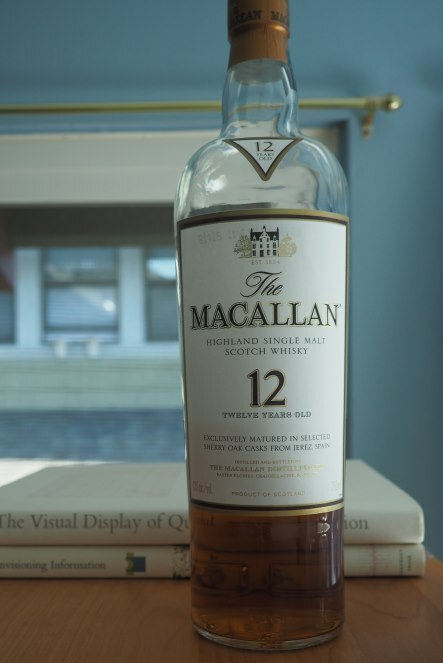 The Macallan 12. Indisputably good whisky. And, if you are lucky enough to be in a country where the 12-year-old is still available, you have a whisky that has aged in these fine barrels for 12 years. The finishing of this whisky is impeccable — you can read about it on their website, and this is a case where the ‘marketing flack’ is backed up by execution. The Macallan is never too bitter, or dusty-tasting, nor does it carry off-putting odd flavors like machine oil that work themselves into lesser whiskies. You may not see the 12 but the ‘Select Oak’ in your local shop. That has happened here in Portland. This product is part of a new and unwelcome trend in Scotland of making whiskies with ‘no age statement.’ Which means, they are selling younger whiskies, usually prepared with some gambit like multiple woods or smaller casks, and usually at higher cost that the old-line 12-year-olds. Happily, Macallan continues to release their 12, 18 and 25-year old expressions of their signature Sherry Oak line. I’ll be pestering my local shops to carry them. Palate: Sweet but balanced, rich fruit, chewy: Lyles Golden Syrup, touch of rosewater. Smooth, a little bitterness from oak tannins to balance out the sherry. Finish: Quick and simple, a touch of oak. Bottom line: On the expensive side of the Glenlivets or Glenfiddich 12s. Relative to other sherried drams, better than Aberlour 12, more balanced than Auchentoshan 12, not equal to the Aberlour a’ Bunadh or Bunnahabhain 12 (but also fewer $$). This entry was posted in Scotch-single malt, Whisky and tagged Aberlour, Auchentoshan, bunnahabhain, Macallan, Scotch, Whisky. Bookmark the permalink. “if you are lucky enough to be in a country where the 12-year-old is still available” – and it’s a big ‘if’! I’ve found bottles of the fine oak, and the gold/amber etc here in Aus, but the 12 year old is a sadly rare beast. Which is such a shame as the Macallan is such an iconic dram – and now I’m a little unsure where to start! Anyway, great article, and I hope you do some more whisky writing/relaxing in future! Yes in the US we can still find the 12. My condolences to Aus(tralia, I presume). I look forward to waffling over to your site. Thanks for reading! Anyway, I hope you enjoy Whisky Waffle!